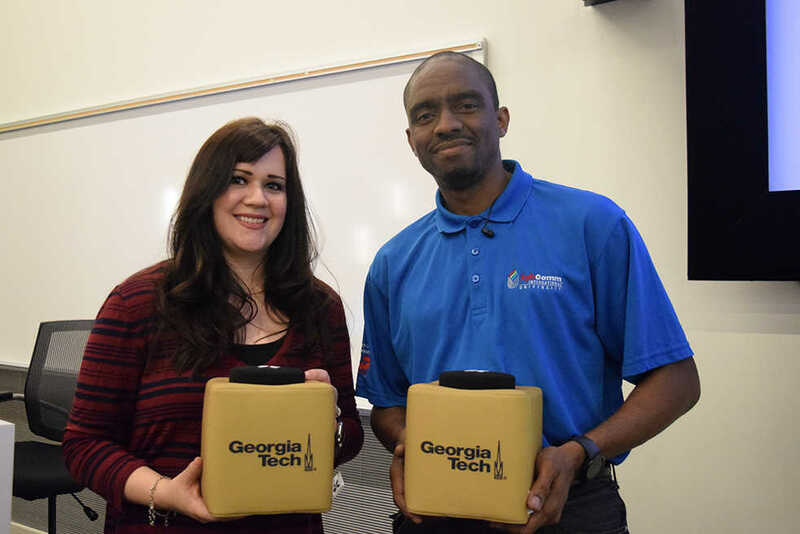 If you saw the SGA candidates debate on Tuesday, March 7, you witnessed the first use of the Catchbox on Tech’s campus. The Catchbox was designed as an alternative to passing a microphone around a large crowd. It is not passed hand to hand — it’s thrown with the goal of fully engaging an audience. Georgia Tech’s Audio Visual Services brought the Catchbox to campus, though it wasn’t the easiest process due to the fact that they did not have a vendor that offered it. AV Services began by finding a vendor willing to carry the Catchbox. Then, talks with GT Licensing began in order to place the Georgia Tech branding on the Catchbox. This included the old gold color, the name, and the Campanile. Initially, the color did not take correctly to the fabric of the Catchbox, which required it to be reprint. Once the microphone arrived, it was tested to ensure compatibility with the Clough auditorium technology and the Catchbox’s use and benefits were publicized. In the future, AV Services want to dedicate two Catchboxes to each Clough auditorium. They also have thirteen rooms planned to undergo upgrades, from this summer to November. A complete digital upgrade has been completed by AV Services in 169 centrally scheduled classrooms.